Chocolate makes the perfect comfort food, after dinner snack, a cure for cravings, and best of all it can be healthy. I want to talk about chocolate because I want to help you get rid of that guilty feeling you get after eating a piece or two. Chocolate can be a healthy snack to add to your diet, and I have information that will help you find the perfect chocolate for your next craving! 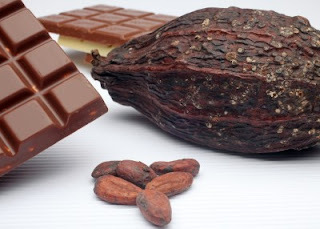 Cocoa (bean) and Cacao (pod) – is the basis of chocolate. When manufacturers start adding unnecessary ingredients, is when it becomes unhealthy. Dark Chocolate – is still considered healthy. It usually contains cocoa, sugar, soy lechtin for texture, and sometimes vanilla (just check the label to aim for all of the additions in a very small amount). * According to a wonderful WebMD article, a recommendation of a 1. 6 oz bar of dark chocolate a day is just the right amount to reap the benefits, without overdoing the calories. I recommend snacking on a small piece after dinner or lunch to avoid wanting the entire bag of chocolate. Antioxidants – called flavonoids are found in dark chocolate. These antioxidants are found on plants that protect them from harm in their environment. When we consume foods with these flavonoids, they have the same effect on us. They protect our bodies from harmful elements we ingest from our environment. Magnesium – is an essential mineral for the body and without an adequate amount, can lead to serious inflammation. Eating foods with magnesium may help prevent heart disease by lowering inflammation in the body, and may also help regulate blood pressure and blood sugar. Milk Chocolate – contains added fat and sugars and diminishes healthy antioxidants chocolate naturally contains. White Chocolate – contains sugar, milk, and cocoa butter, without even containing actual cocoa. Sweetened Chocolate – is usually sweetened with way too much sugar. Be sure to check the label. If it is a semi-sweetened chocolate it probably contains only a small amount of sugar. Ingredients – if it contains one or all of the following you are heading in the right direction! Dark Chocolate, Cocoa, Cacao. Looking for an organic version is always a good option. 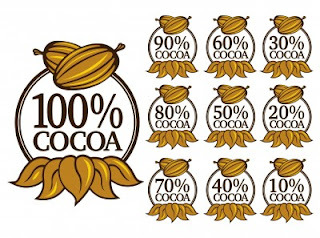 Percentages – some packages show the actual percentages of how much dark chocolate or cocoa it contains. Look for the highest percentage. Check the Label – after finding the main ingredient and percentage, check the back label and try to avoid packages with all the other ingredients the manufacturers may have snuck into the chocolate. Whats your favorite healthy dark chocolate?